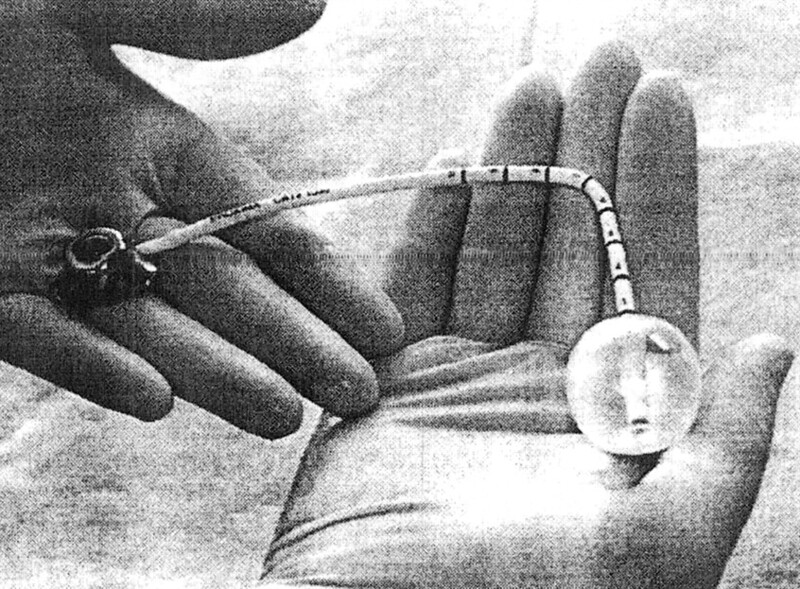 This letter is written to describe the GliaSite RTS balloon catheter system (Fig 1) used to deliver localized radiation therapy to patients after resection of malignant tumors. The device is temporarily implanted in resected brain tumor cavities, and the balloon portion is inflated with radioactive fluid. This delivers a prescribed dose of radiation to the tumor bed without the liquid coming into contact with the tissues. The main components of the GliaSite device are an infusion port, a catheter, and a silicone balloon. The infusion port, composed of titanium, polysulfone, and silicone, provides access for inflating and deflating the balloon. The catheter consists of bilumen tubing composed of radiopaque silicone. The balloon portion has a dual configuration, with an inner balloon serving as a primary reservoir for the radioactive liquid, and an outer balloon serving as a backup in the event that the inner balloon breaks. Two radiopaque bands that consist of tungsten-loaded ink are located at the proximal and distal ends of the inner balloon, allowing for radiographic visualization of the balloon. The components of the GliaSite allow for visualization on MR images, CT scans, and conventional radiographs. Before radiation therapy is administered, MR imaging, CT, or conventional radiography is used to verify device integrity and localization. When the balloon is inflated to the desired treatment volume with a solution of 75% normal saline and 25% nonionic contrast agent, MR imaging can further be used to ensure conformance of the surface of the balloon to the resection cavity wall. The GliaSite RTS was used in an investigational protocol. The study had a total of 21 patients (including two at our institution) with recurrent high-grade primary brain tumors that were treated with the device. In addition, it is currently under investigational study for use in breast lumpectomies. The device uses Iotrex (iodine-125), which provides the source of radiation. The device delivers therapeutic radiation from 0.5 to 1 cm away from the balloon edge at a dose of 50 Gy (range, 40–60 Gy). The radioactive fluid is instilled into the GliaSite RTS device while the patient is in the radiation therapy suite. The balloon remains filled for 73–160 h, depending on the dose to be delivered. 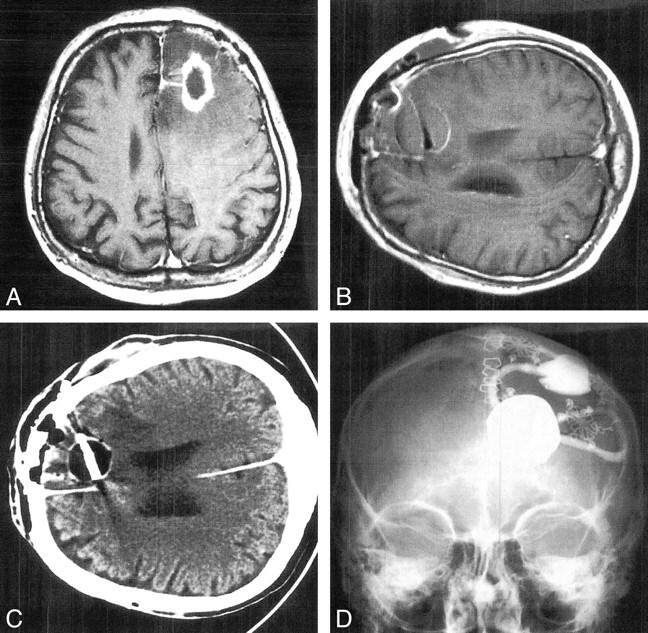 The GliaSite RTS device was used to treat a patient with a ring-enhancing lesion with vasogenic edema in the left frontal lobe, which was proved at biopsy to be a glioblastoma multiforme (Fig 2A). An axial T1-weighted MR image showed that the spherical intracavitary device expanded to the tumor bed (Fig 2B). The contents were isointense with brain parenchyma, with a linear low-signal-intensity area, which is the catheter leading into the device balloon. An axial view CT scan without contrast enhancement showed the spherical intracavitary device expanded to the tumor bed (Fig 2C). The contents showed lower absorption coefficients than those of CSF in the ventricles. The spherical rim was hypoattenuating on CT scans, as was the catheter leading into the device. An anteroposterior conventional film radiograph of the skull showed a radiopaque intraaxial spherical device (Fig 2D). The injection port and catheter tubing were visualized and were external to the cranial bones. fig 2. Images in a patient with glioblastoma multiforme treated with the GliaSite RTS device. A, Axial T1-weighted contrast-enhanced MR image of the brain shows a ring-enhancing lesion with vasogenic edema in the left frontal lobe, which was proved to be a glioblastoma multiforme at biopsy. B, Axial T1-weighted contrast-enhanced MR image in the same patient after surgical implantation of the tumor bed radiation delivery device. Note that the liquid contents of the inflated device have signal characteristics similar to those of brain with this sequence. C, Axial CT scan in the same patient shows the appearance of the device. The contents of the device have lower absorption coefficients than does ventricular fluid. D, Device as seen on conventional radiograph. All elements are radiopaque on CT scans. 1 Address reprint requests to Eric A. Dame, 8215 Anglers Point Drive, Tampa, FL 33637.